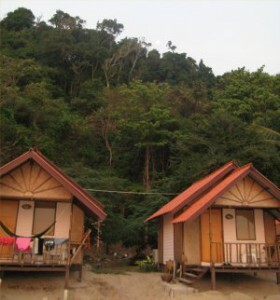 Three days on the Island of Koh Chang. After flying from bangkok airport we landed at Trat airport on the first leg of our journey to Koh Chang. The flight was very comfortable and refreshments onboard were a lot nicer than I had expected. 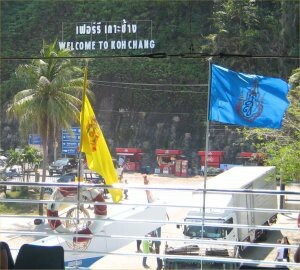 We were driven to the airport “terminal” by jeep and then jumped in a minibus (300 THB) for the rest of the journey to Koh Chang. 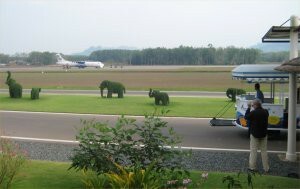 I really like the elephants made from bushes that adorned the runway. Our minibus stopped at the ferry port Ao Thammachat. Typically, nobody knew when the boat was going to sail, so we just stood around waiting. After a while, seemingly because someone in charge felt like it our ferry left port. One of the cars we lodged quite near the back of the ferry and frank commented that we could be embarking on a 2nd Herald of free enterprise. We get our first glimpse of Koh Chang at Ao Sup Pa Rod – Pineapple Bay in English. I had been told there was a restaurant near the port where you could catch your own fish. Unfortunately, we didn’t hang around at this end and I never got chance to visit it. We arrive at White Sands Beach and check into our hotel, the Alina Grande. Located on the first floor, we had this spectacular view. One evening when there was a party going on downstairs Frank and I sat out on this beautiful balcony. It was late afternoon when we arrived, so we relaxed around the hotel and then went out for the evening. 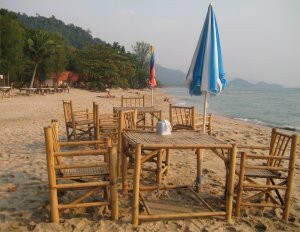 I had researched the trip extensively and all of the web guides recommended having dinner on the beach. There were loads of restaurant to choose from. In the end we couldn’t decide so just picked one at random, sat down and got stuck into some beers. The catching up of old times began in earnest. The food when it arrived, was superb. I had Chicken and beef, Frank had something Thai. I thought the chefs looked pretty cool with there skirts on (not sure I would have had the courage to wear one though). They served Fish from this traditional boat. The next day, we go for a wander along the beach. 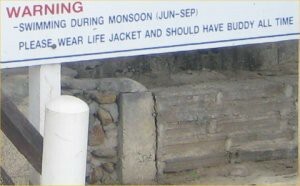 As we wandered further I saw this sign. It was good to have my old friend Frank around, and the line about should always have a buddy, seemed poignant at that moment. We continue along the beach which really was spectacular. An area on the beach had 2 trees close together and a scantily clad western girl lay sunbathing there, so that everyone had to walk around here. Frank and I commented that even in the worlds most beautiful places, there’s always a spanner around and I’m not talking about one in a workshop. The beaches obviously circles the island with roads and resorts. 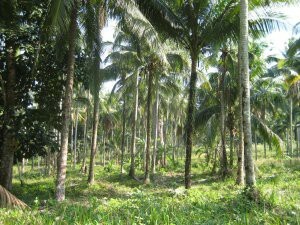 Inland a tropical rainforest which reaches quite high altitudes is illustrated in this picture. We were staying in a hotel across the road from the beach. 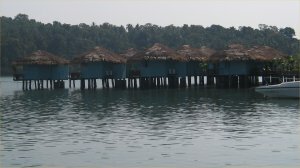 More expensive hotels were actually on the beach and the cheapest form of accommodation were huts. 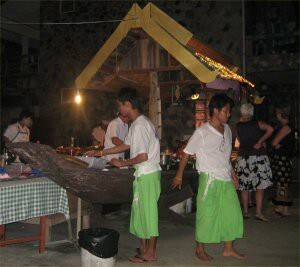 The nightly cost of the huts varied with the facilities available. 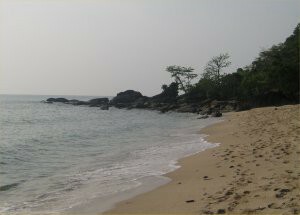 We walked as far up the beach as possible, before reaching a rocky outcrop. 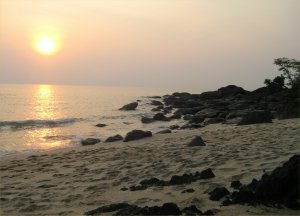 It was the most peaceful part of the beach. 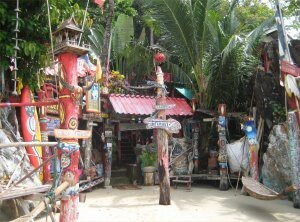 We found this voodoo theme’d hotel (a collection of huts in actual fact). At high tide, it was just a few metres from the water. 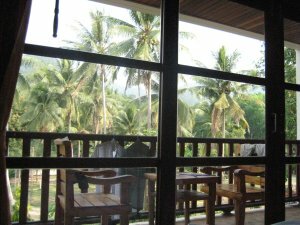 Each room/hut had a balcony with a hammock hung up on it. It had more character than any acclamation I saw on the island (although I’m not sure how comfortable it would have been to stay in). 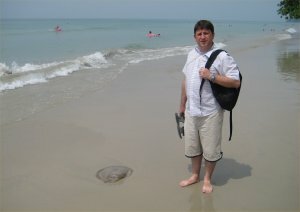 Frank spots a jelly fish. Were British in the end, and knocking 40 weren’t exactly going to put on a pair of speedo’s. 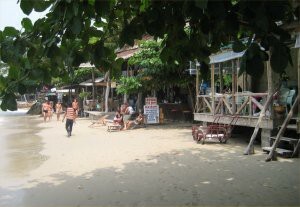 It was a warm day and we visited this small cafe on a quieter part of the beach. A couple of beers and the usual chat about family and stuff like that. Listening to the waves splash against the shore was a relaxing experience I don’t get to enjoy very often. As we sit, the Sun heads towards the horizon and the end of another beautiful day. 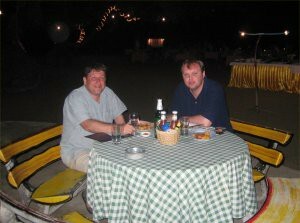 In the evening, we go out for a Curry and then visited a Bar. 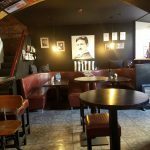 There were girls in the bar, trying to strike up a conversation and worse. Not really my thing. The sort of lead girl, asked me if I wanted to play pool. I knew from experience, it would be simpler to put all of my money into an envelope and hand it to her. 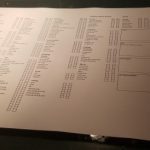 We started playing connect 4. I won the first game, then I was shocked to see that she had won the 2nd game. She quickly realised that I was surprised and in the next few games, she played really badly. I was convinced that she was deliberately losing. Without being judgemental, I am a 20 year experienced engineer and she a bar girl. How could she possibly beat me ?. After a quick discussion with Frank, I bet her 400 Batt, that she couldn’t beat me. She looked a little cautious. I explained that if I won, she wouldn’t have to give me anything and that Frank would hold the money while we played. Her expression changed. Although I’ve never seen it, I imagine, as an assassin loads a sniper rifle, he has a similar expression to the one she had. In less than 8 moves, she had beaten me. Chatting on the way home, the ever wise Frank explains – There are literally hundreds of thousands of Bar girls in Thailand. 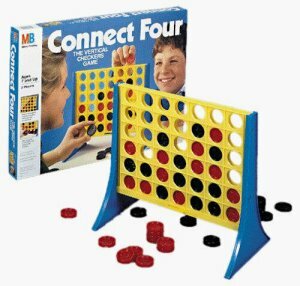 They don’t usually receive much of an education, but connect 4 requires intelligence. With that number of girls, statistically, many of them could be scientists or Dr’s. I think you’ve just been beaten by one of them. In many cases their family’s don’t know what they do, so I didn’t take any pictures. The following day we decided to get out and explore some more of the Island. 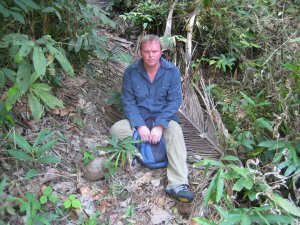 Wanted to get a jeep but we had a limited budget and costs on the Island were a lot higher than Bangkok. We decided to wander along the coastal road, as it gave the best views of the Ocean. 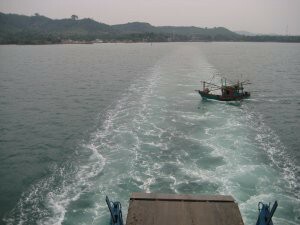 There were a number of small Island just of the coast of Koh Chang. 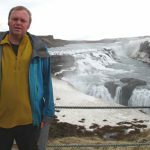 It was possible to go on a boat trip and visit some of the Island. From here we could see people canoeing to the Island. This must have been smart, as you would effectively have the whole island to yourself. We stopped here for a can of coke and then continued on our way. 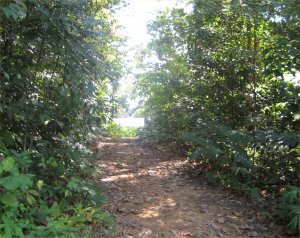 As we trekked we crossed various sort of vegetation and landscape. At times there was no path as such and we just walked through fields like this one. 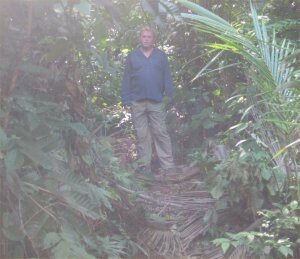 On other occasions we walked through the jungle undergrowth. 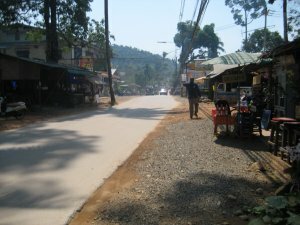 We arrive at Bang Bao. A small town literally on legs. Shops, restaurants bars all connected by wooden walkway. There were mattresses, nappy’s and all sorts of things there. 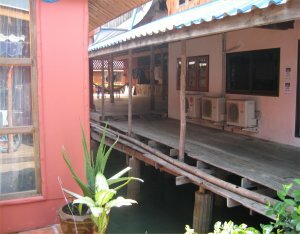 Further away, this hotel was made up of a collection of stilted huts connected by a walkway. I wish we had more time there, I would love to have stayed in one of these. 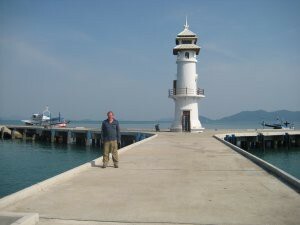 The lighthouse at Bang Bao. The colour of the ocean, the colour of the sky and the salt air all combined for one of life’s special moments. The following day, back to Bangkok. We decided to save money and travel by minibus. Frank calculates that a 5 hour journey to Pattaya a stopover there and then 2 hours back to Bangkok will work. 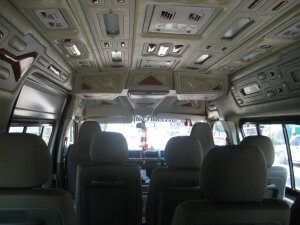 The minibus was at least air conditioned, but confusion about who was traveling and who wasn’t made it leave 90 minutes late. Still we met some pretty cool guys from the North-east of England and had a good chat with them on the way. The minibus rolls onto the ferry. We get out and sit on the viewing platform. 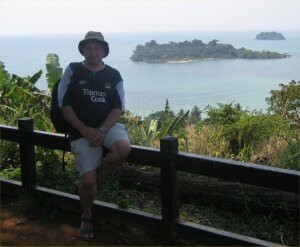 A last look at Koh Chang. 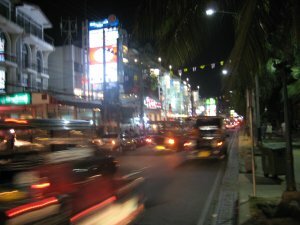 I had visited Pattaya before and spent 9 days there (one of the happiest times of my life). This was a bit different. We weren’t staying in the Woodlands this time. We wandered around looking for somewhere cheap and ended up in some flop house called the Carlton. Never mind it had a bath so I got cleaned up; got some sleep and we headed out for a couple of drinks. I got this action shot of the Ocean road at night. 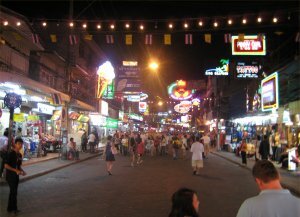 I had walked down the famous walking street on my previous visit during the daytime. I had read that the place came alive at night and that was certainly true. The usual fayre of restaurants/takeaways selling just about every type of cuisine, souvenir stalls of every kind, the usual adult entertainment and of course a couple of Irish bars which we made straight for. 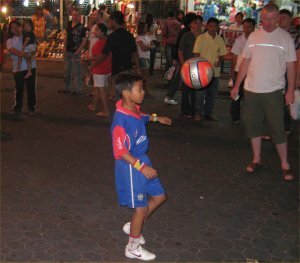 While walking along the street we saw this young boy who had spectacular football and balance skills. He immediately caught everyone’s eye. I quickly composed myself as I have seen pickpocket distractions like this in other countries before. I shouldn’t have worried, he had a sign saying he needed money to start a foot balling career (I thought it only took talent ?) and asked for donations. Since his “act” was pretty good, we put 20 bat in his bucket. 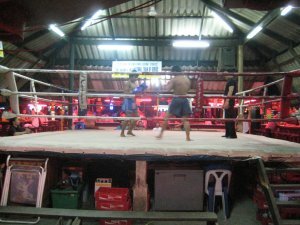 I fulfilled a personal ambition by visiting a bar that had live Thai Boxing. Neither competitor appeared to be fighting for freedom or the love of a good woman, if you know what I mean. That said it was entertaining. At the end of the match, their “trainer” brought the victor out and we were invited to tip him. Minutes later he returned with the loser expecting the same treatment. My western culture has a problem with rewarding failure in this way. I decided that since the man had been beaten like a gong for my entertainment he deserved something. The following day we caught the bus back to Bangkok.